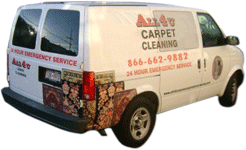 Why buy new furniture when Novato All 4 U Carpet Clean can make your sofa look new again? From microfiber to leather, we can make your upholstery look like it did when you first brought it home. We will thoroughly and (if requested) organically clean your upholstered chairs, sectional sofas, ottomans and love seats. We can clean your car seats as well! No matter what type of upholstered furniture you have, All Green Carpet Clean will carefully restore the material, increasing the comfort and cleanliness of your home. Please call us for a free estimate, (866) 503-3336.